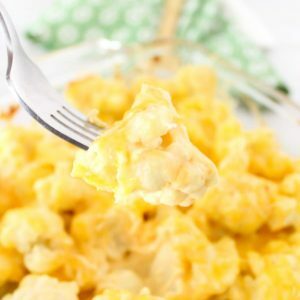 Loaded to the brim with gooey, cheesy goodness, this cheesy cauliflower casserole is the perfect low-carb and keto friendly macaroni and cheese substitute. Bring large pot of water to a boil. Add cauliflower and 1/2 tsp salt and cook until cauliflower is just fork tender. Do not over cook. Drain cauliflower well and place back in pot. Set aside. In a small sauce pan, bring cream to a simmer, stirring well to avoid scorching. Whisk in cream cheese and mustard and stir until mixture thickens. Remove from heat and whisk in 1 cup shredded cheese and seasonings. Pour over cauliflower and gently mix to combine. Place cauliflower in prepared dish. Sprinkle with remaining cheese and bake until cheese is bubbly and slightly browned, or about 15 minutes.